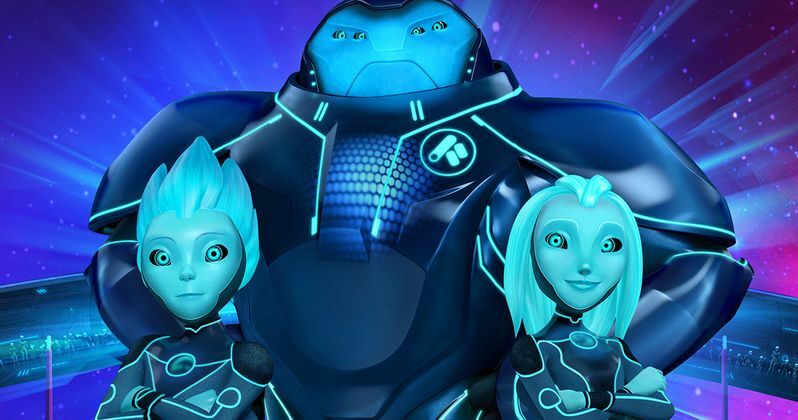 Guillermo del Toro unveiled the first episode for Tales of Arcadia: 3Below at NYCC earlier today. Additionally, a teaser trailer for the show was released online and you can watch it below. Del Toro serves as the creator and executive producer and he was joined by voice talent Diego Luna, and fellow executive producers Rodrigo Blaas, Marc Guggenheim and Chad Hammes for the special event. The panel, along with moderator Whitney Matheson, also introduced the all-star voice cast including Glenn Close, who made a surprise appearance. Fans of the 7 time Emmy winning Trollhunters will see several familiar faces in Tales of Arcadia: 3Below. The show tells the story of two royal teenage aliens and their bodyguard as they flee a surprise takeover of their home planet by an evil dictator and crash land in Arcadia. They are now on the run from intergalactic bounty hunters and are struggling to blend in and adapt to the bizarre world of high school, while also attempting to repair their ship so they can return and defend their home planet. Guillermo del Toro described Tales of Arcadia: 3Below as an immigration story at the panel. Glenn Close appeared on stage and brought her little dog Pip with her to share the excitement. When Close introduced the dog as "Pippy," and Guillermo del Toro joked that the dog might pee at his feet. Close then went on to talk about animated films and how they have had a huge impact on her life and made her who she is today. Before closing out the panel, del Toro's fellow panelists surprised him with an early birthday cake, which is when the audience joined in to sing him Happy Birthday. DreamWorks previously announced that Tales of Arcadia: 3Below will feature Diego Luna and Tatiana Maslany in the lead roles of Krel and Aja from the final season Trollhunters. Nick Offerman, Andy Garcia, Nick Frost, Alon Aboutboul, Chris Obi, Uzo Aduba, Cheryl Hines, Tom Kenny, Haley Atwell, Danny Trejo, and Ann Dowd will also be lending their voices along with other returning talent from Trollhunters including Emile Hirsch, Charlie Saxton, Lexi Medrano, Steven Yeun, Cole Sands, Kelsey Grammer and more. Additionally, The Crystal Method created the main title theme that you hear in the opening credits video. Guillermo del Toro went on to praise Tatiana Maslany, who plays the alien princess Aja, calling her "one of the best actresses working." Del Toro is clearly very excited about Tales of Arcadia: 3Below and fans of Trollhunters are definitely excited now. The show is all set to premiere December 21st on Netflix, so we don't have to wait too much longer to finally see the show. The third part of the series, Wizards will premiere some time in 2019. For those of you who need just a tease, you can watch the brief trailer for Tales of Arcadia: 3Below right here, thanks to the DreamWorks YouTube channel.